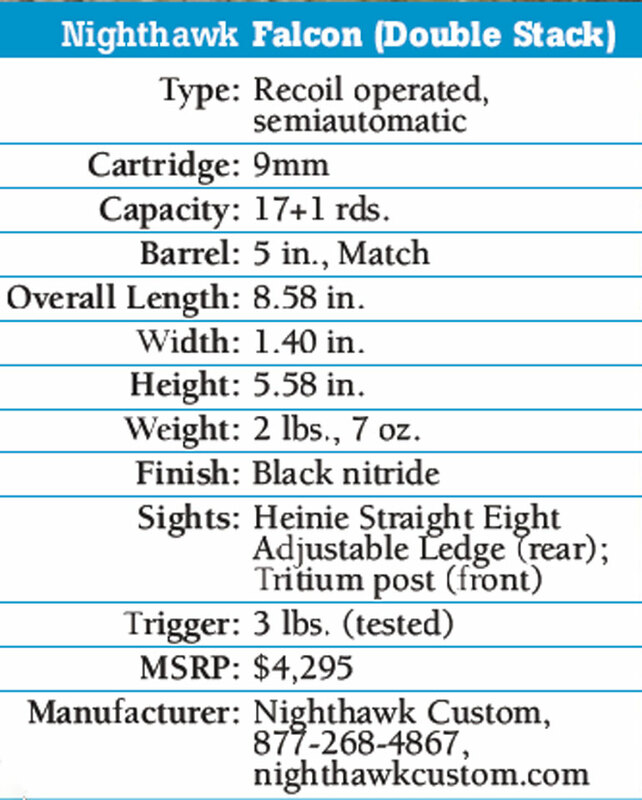 Mark Stone and his Nighthawk team now offer $650 double-­stack upgrades for all of their 9mm 1911 pistols. Leading the double-­stack pack is the sleek and popular Falcon, a full-­sized, 9mm single action. 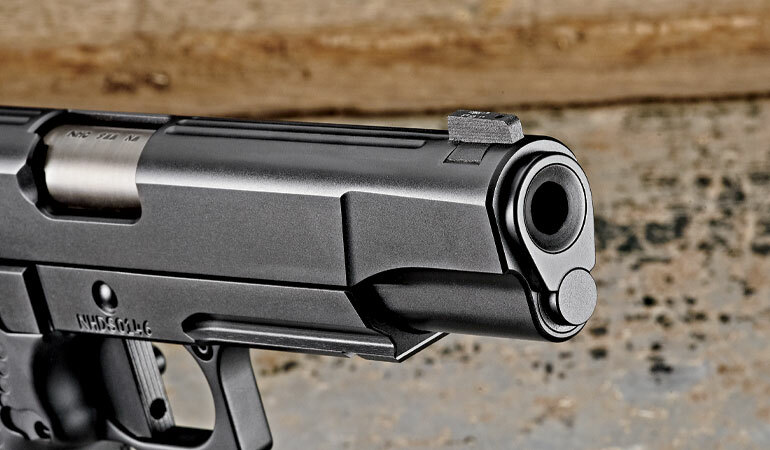 Featuring a 17-­round capacity and a 7075-aluminum frame, its single-­piece grip design reduces grip circumference and makes the pistol more comfortable to shoot. The .140-­inch, flat, mill texturing provides an excellent grip for any environment. The mainspring housing is profiled and texture matched. 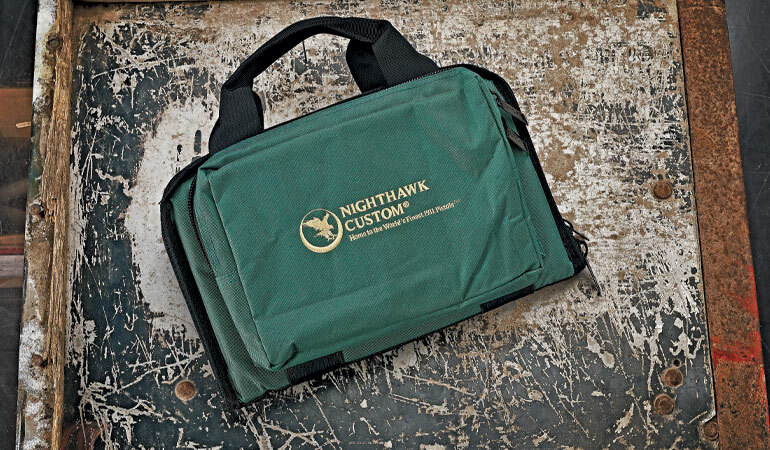 This gives the Nighthawk a 360-­degree gripping surface that not only looks good, but is practical without being overly aggressive or radically styled. The oversized, integral magwell accepts most aftermarket base pads and makes magazine swaps quick and intuitive. Double-stack 1911s in 9mm are going to be popular. The Falcon Double Stack’s grip completely fills the hand and offers great balance. Even after a long range session, the 9mm Falcon Double Stack didn’t cause my hands or wrist any fatigue. 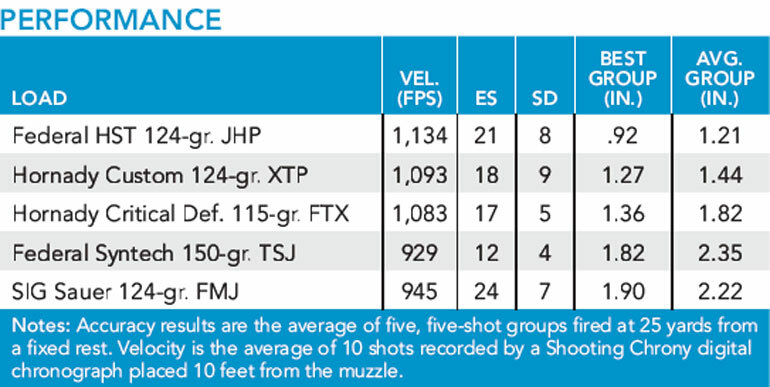 With an unloaded weight of 391/2 ounces, this is one of the most manageable 9mms in terms of recoil — even during rapid fire. Heinie’s Straight Eight Ledge rear sight and the Trijicon tritium front offer fast and precise sight picture in any light conditions. In late afternoon, the serrated surface of the rear sight actually helps to cut down glare and makes the sight easy to see. Even as evening approached and the light of day subsided, the sight combo continued to perform well. The front and rear sights are dovetailed into the slide. The rear sight comes with dual set-­screws and is drift-­adjustable for windage. The metal is treated with a low-­gloss nitride finish that’s very smooth and ­durable. The Straight Eight sight layout is functional and practical for both rapid fire and precision work. If irons are too hard to see, then there’s an accessory rail under the dustcover where you can mount a laser or light. The triggerguard is squared-­off and high-­cut, while the trigger inside is Nighthawk’s flat-­front version. This trigger was crisp and easy to learn, breaking at exactly 3 pounds on a trigger gauge. It is so sweet that it will leave you rethinking everything you thought you knew about Browning’s trigger geometry. Nighthawk has embellished the Falcon Double Stack with all manner of enhancements, but there’s nothing overwhelming or garish about the gun. Its basic, black appearance and grip give the Falcon a workmanlike look. On closer examination, the finer details are more apparent. A trio of ball-­cut grooves run the length of the top of the slide, and the rear cocking serrations are ball-­cut as well. The shortened slide stop rests in the beveled frame, and the slide stop and recoil spring plug are smooth. 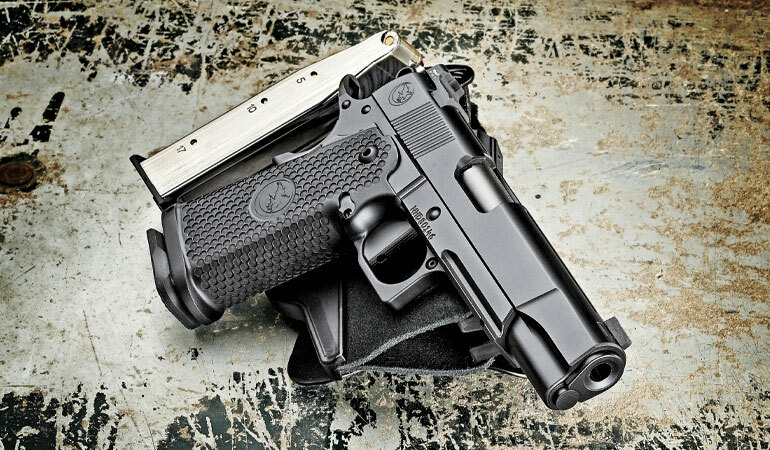 Nighthawk’s crowned, match-­grade, 5-­inch barrel sits flush with the bushing and the front of the slide received the brand’s signature Hi-Power-style cuts. Every line on this gun is smooth, precise and perfectly machined, and the action is sleek and butter smooth. 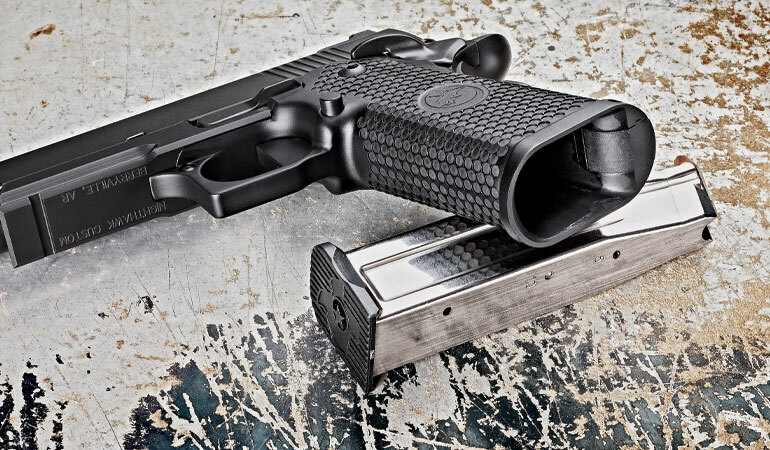 Aside from the 6-­inch Les Baer, no gun in the test felt more like a target pistol than this Nighthawk. It’s easy to understand why so many shooters favor this design. The high-­cut triggerguard and beavertail design promote a high handhold on the pistol. When you combine that with the large, comfortable hand-­filling grip, this is simply one of the nicest 1911s you’ll ever shoot. It wasn’t finicky regarding its diet of ammunition. The Falcon has always been very accurate. This one produced the best group of the entire test: five-­shots in .92 inch with Federal’s HST ammunition! This was also the best gun of the bunch to shoot off-­hand accurately. I credit the wide grip and full-­length barrel that barely seems annoyed by 9mm recoil. The Falcon Double Stack may be dressed in basic black, but that’s about the only basic thing about this gun. Suggested retail price for this pistol is $4,295.